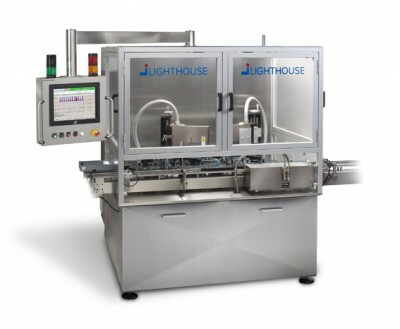 The automated headspace machine platform can be configured for total headspace inspection. The VISTA/THC In-Line Inspection System is an in-line, 100% inspection and rejection system designed to simultaneously monitor oxygen, pressure, and moisture levels. The VISTA/THC System is capable of directly measuring oxygen concentrations, total pressure/vacuum levels, and moisture levels in the headspace of optically transparent packages. Applications include 100% container closure integrity testing of lyophilized and liquid product, headspace oxygen monitoring during the filling of oxygen-sensitive product, and 00% moisture determination of freeze dried product.